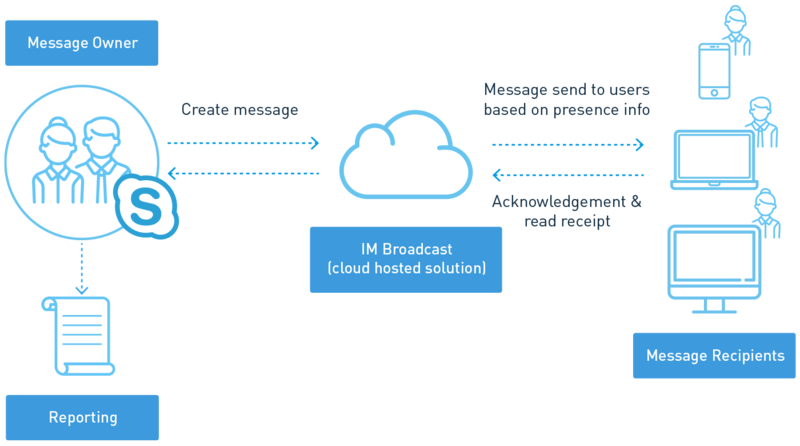 Modality Systems IM Broadcast is a presence-based alerting and messaging application. It allows companies to send single instant messages - via Microsoft Skype for Business - to specified groups of users across the organisation as a simple, timely and targeted alternative to email for ‘must read’ company announcements. It’s all too easy to miss emails in today’s overflowing inboxes, and the implications of some messages going unseen can be significant. With IM Broadcast, online users are sent the alert via an instant message, at a pre-defined time, enabling them to act instantly. If the users are offline, IM Broadcast notifies them the moment they come online again. Nothing is missed or ignored, and action can be taken in a timely manner. IM Broadcast is built for organisations seeking an alternative to email for important and time sensitive communications. Using on-screen, instant messaging pop-ups, it avoids the chaos of overflowing inboxes and the easy-to-ignore nature of email to ensure company news and announcements are received, read and acted upon in an efficient and timely manner. Messages can be scheduled, expiry dates added, and links included with additional content or specific actions, while customisable reporting allows senders to see who has viewed the messages, and crucially, who hasn’t. Want to find out more about IM Broadcast? Send us some information about you and your company and a team member will get in touch with you.